Iraqi security forces will dig trenches around Baghdad — a distance of about 60 miles — in an attempt to prevent insurgents and explosive-laden cars from infiltrating this city of 6 million, the Interior Ministry said Friday. A vehicle curfew for Friday prayers managed to curb violence in Baghdad for the day, with police reporting only two shooting deaths. But another 30 bodies of torture victims turned up in the capital — including one of a man who had been dismembered and thrown into the Tigris river. A U.S. soldier was killed when the vehicle he was traveling in was struck by a roadside bomb in Baghdad on Friday, shortly after a Marine was killed in action in Anbar province, the U.S. command said. A surge in violence has seen more than 130 people slain in Baghdad on Wednesday and Thursday — either killed in bombings or tortured and shot before being dumped on the city's streets. The U.S. military blames the surge in sectarian killings on death squads that roam parts of Baghdad. In the mixed northwest Hurriyah neighborhood, leaflets thrown on its streets Friday threatened to kill 10 Sunni Arabs for every Shiite death. "Mujahideen elements will kill 10 Sunnis if one Shiite is martyred inside or outside Hurriyah," the fliers said. Iraqi Kurds have demanded that the chief judge in the Saddam Hussein trial step down after he told the former president "you were not a dictator" in court. Judge Abdullah al-Amiri already has refused prosecution requests to step down over the comment, which a court spokesman attributed to a "slip of the tongue" on the experienced judge's part. Shiite politicians, meanwhile, said they had made progress in trying to break a deadlock over legislation to establish autonomous regions as part of an Iraqi federation. Sunni Arabs oppose the bill, fearing it could split Iraq into three sectarian and ethnic cantons. The proposed legislation could be introduced next week. A spokesman for the Conference of People of Iraq, a prominent Sunni Arab political party, was shot and killed Friday by gunmen, said a party official who did not want to be identified because he fears for his life. The spokesman was also an imam at a mosque in Baghdad and was on his way to conduct prayers at a mosque in Garma, 19 miles outside of Baghdad, when he was killed. Inspired by Islamic history, the plan to dig trenches around Baghdad is the newest — and perhaps strangest — twist in what has so far been a losing battle to prevent suicide car bombs and other weapons from being smuggled into the capital. "Trenches will be dug around Baghdad in the coming weeks," Interior Ministry spokesman Brig. Abdul-Kareem Khalaf told The Associated Press. "They will surround Baghdad." He provided no details of what distance the trenches would cover, nor how deep or wide they would be. In yet another twist, President George W. Bush also mentioned that Iraqi authorities had new plan to safeguard Baghdad but he spoke of building berms rather than digging ditches. "And so they've got a plan now. They've adapted. The enemy moved, we'll help the Iraqis move. They're building a berm around the city to make it harder for people to come in with explosive devices, for example," Bush said during a White House news conference. 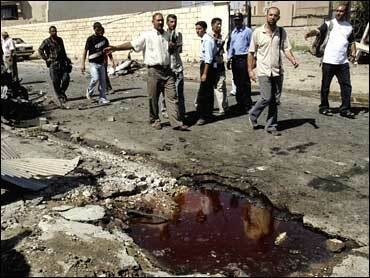 Car bombs are responsible for much of the killing in Baghdad. Most are thought to be assembled in areas just south of the city, in the so-called Triangle of Death. There have been past operations to prevent such bombs from being smuggled into the capital, but most involved setting up checkpoints. The first such grand plan — dubbed Operation Lightning — was launched with much fanfare in May 2005. It deployed more than 40,000 Iraqi police and soldiers, backed by U.S. troops and air support. One of its main goals was to prevent car bombs assembled south of Baghdad from reaching the capital. But it failed, and a year later, as killings in Baghdad surged, a joint U.S.-Iraqi security plan known as Operation Together Forward was launched on June 15. It too has made little headway, with the Baghdad death toll surpassing 1,500 in July, triggering fears among the U.S. military that civil war was about to break out. Thousands of U.S. troops were moved in from Iraq's volatile Anbar province, where the insurgency is still strong, because curbing sectarian violence in Baghdad is a higher priority, one the top American commanders said Friday. "The main effort is Baghdad, and we must ensure that we weight the main effort," Lt. Gen. Peter Chiarelli said. He was using military terminology for drawing on available troops elsewhere in order to bolster the military effort in Baghdad. As part of the trench plan, Khalaf said vehicle and pedestrian traffic would be restricted to just 28 entry points with manned checkpoints. Similar checkpoints exit now along some central routes through Baghdad, including the highway to the airport. But they need hundreds of troops to maintain them. "We will leave only 28 inlets to Baghdad while all other inlets will be blocked. Supports will be added to the trenches to hinder the movements of people and vehicles. The trenches will be under our watch," he said. According to Khalaf, the plan was inspired by the 627 battle of Khandaq, or battle of the trench, during which the Prophet Mohammed protected the city of Median from a far larger army by digging deep trenches. The idea for the trench was introduced by one his companions Salmon al-Farsi — or Salman the Persian. Khalaf said that if it was possible at the time to dig such trenches with hand tools, it should not be a problem to dig them today using modern machinery.